Power input for servos and speaker. Connect to a beefy 5V power supply. Pins are ground (top), and +5V (bottom). Numbered from 0 (top) to 15 (bottom). Pins are ground (left), power (middle), and signal (right). Make sure servos are connected correctly! Ground is usually colored black or brown, power is usually red, and signal is usually orange, yellow, or white. Connector to attach the board on top of a Raspberry Pi. The board also provides power to the Raspberry Pi through this connector, so no separate USB power supply is needed for the Pi. Connect to a separate 5V 2A power supply, do not use the same power supply as the servos, as voltage drops from large current draws will reset the Raspberry Pi. Pins are +5V (top) and ground (bottom). Used to flash firmware onto the board&apos;s ATMega328 microcontroller. A programmer is needed for this, e.g. AVRISP mk2. This is normally done only once. 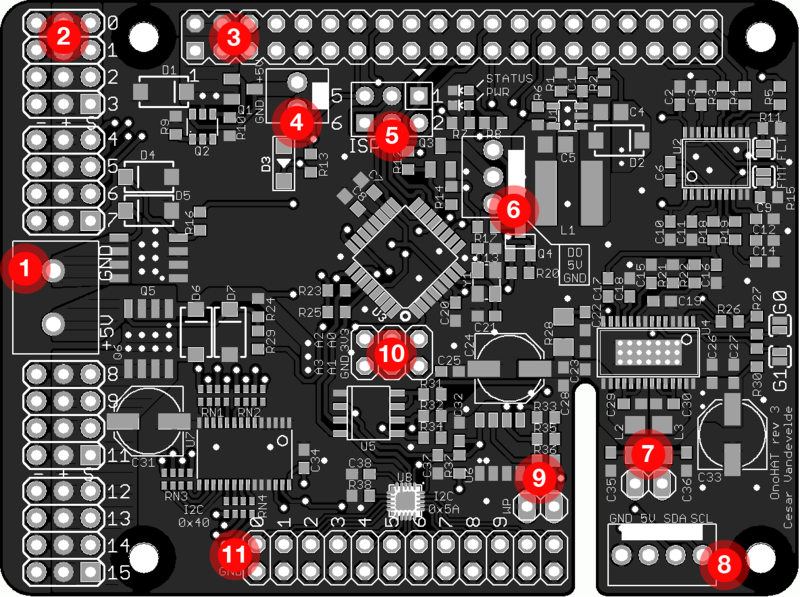 To program the OpsoroHAT, the board should be disconnected from the Raspberry Pi, and should be powered by an independent 3.3V power supply. The board can be powered in this way through connector 10. The board is designed to drive a 4 ohm 5W speaker. 8 ohm speakers can also be used, but the audio output will be quieter. The pins are not polarized, orientation of the speaker does not matter. Write-protect for the HAT identification EEPROM. Bridge this header with a jumper to program the EEPROM. Currently not used. Connect any electrically conductive material to these pins to create touch sensors. The bottom row is connected to ground, this allows you to use shielded wires. The electrodes should be connected on the top row. Electrode pins are numbered 0 (left) to 11 (right).